The goal of the McAllen ISD Special Education Department is to meet the various needs of students with disabilities in order to provide a free, appropriate public education under the Individuals with Disabilities Education Act, (IDEA). 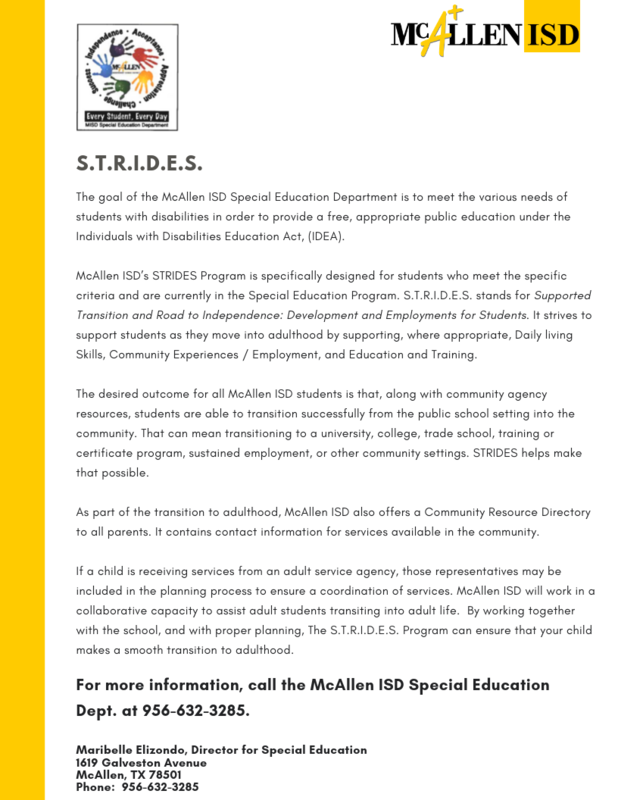 McAllen ISD’s STRIDES Program is specifically designed for students who meet the specific criteria and are currently in the Special Education Program . S.T.R.I.D.E.S. stands for Supported Transition and Road to Independence: Development and Employments for Students. It strives to support students as they move into adulthood by supporting, where appropriate, Daily living Skills, Community Experiences / Employment, and Education and Training. The desired outcome for all McAllen ISD students is that, along with community agency resources, students are able to transition successfully from the public school setting into the community. That can mean transitioning to a university, college, trade school, training or certificate program, sustained employment, or other community settings. STRIDES helps make that possible. As part of the transition to adulthood, McAllen ISD also offers a Community Resource Directory to all parents. It contains contact information for services available in the community. If a child is receiving services from an adult service agency, those representatives may be included in the planning process to ensure a coordination of services. McAllen ISD will work in a collaborative capacity to assist adult students transiting into adult life. By working together with the school, and with proper planning, The S.T.R.I.D.E.S. Program can ensure that your child makes a smooth transition to adulthood. For more information, call the McAllen ISD Special Education Dept. at 956-632-3285.